6am in Myrtleville. 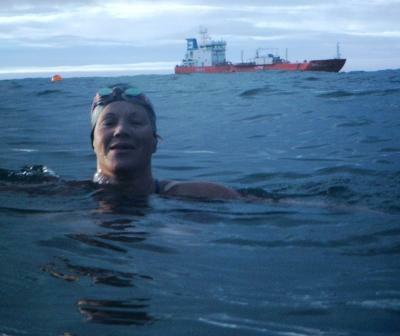 Carmel Collins – with seven weeks to her Channel swim – takes a break after the ship got tired and stopped. This entry was posted in Information and tagged English Channel Swim, Marathon Swimming, Open water swimming - Cork, Sea swimming - Cork by myrtlevilleswimmers. Bookmark the permalink.